(91outcomes.com) - A discovery by a Minneapolis medical researcher may lead to a new test to help identify Gulf War Illness, a unique disease that affects 250,000 veterans of the 1991 Gulf War, according to official estimates, as well as other U.S. forces. Using sophisticated brain mapping equipment and techniques called magnetoencephalography (MEG) that looks more like something from a science fiction movie, Dr. Aposotolos Georgopolous of the Minneapolis VA Medical Center has found a unique visual signature of a “core” brain abnormality in GWI. According to Georgopolous, the essence of brain function is communication among neural ensembles, and neural communication is accomplished by ongoing, dynamic interactions among multiple “neuronal ensembles.” Dr. Georgopolous has used MEG to identify unique visual signatures of the neuron ensembles for an array of other diseases. Georgopolous’s MEG findings provide further evidence to a large and growing body of objective scientific evidence that shows GWI is a distinctly separate disease entity rooted in damage to, and dysfunction of the brain. The findings were presented before the Congressionally chartered Research Advisory Committee on Gulf War Veterans' Illnesses (RAC-GWVI) in public meetings this week in Boston, Mass. Georgopolous expressed the need for his current study needs to be extended to larger numbers so as to include detailed examination of subgroups with comorbidities -- other diseases and conditions that may also be simultaneously afflicting some GWI patients. However, his current findings remain compelling and his unique identification through highly advanced technology of a “core” brain abnormality in GWI has profound implications. 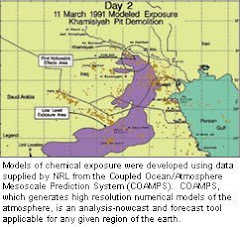 The scientific and medical communities are finally coming to consensus on the likely cause of the wide array of medical symptoms suffered by more than 200,000 Veterans of the 1991 Persian Gulf War. And what's breathtaking about this is that the answer makes so much sense. What, besides a dysfunctional brain could possibly cause so many seemingly unrelated physical symptoms to occur simultaneously (e.g., body-wide muscle pain, profound fatigue, dermatological inflammation, gastrointestinal inflammation, poor sleep patterns, etc.)? The answer is simple, so simple that even a dumb old Jarhead like me can understand it. If the autonomic nervous system in the brain has been damaged, the signals that it sends to various parts of the body are obviously going to be the wrong kinds of signals. As one who has lived with these very debilitating symptoms for nearly twenty years, to say that I'm excited about the findings of these recent studies would be an understatement. As I came to understand how important a role the central nervous system plays in basic bodily functions, for me it was literally an epiphany. 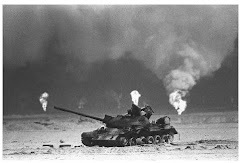 The dots are finally being connected; the puzzle is beginning to take shape, exposing a much clearer picture of Gulf War Illnesses. And I for one cannot wait until the last piece of that puzzle is in place. I want to be around when that day comes. Why? Beyond my hopes for more effective medical treatments, I just want to see the looks on the faces of the Washington bureaucrats who have fought so hard all these years to conceal what they no doubt know about the CAUSE of this brain damage. That’s when the real fun will begin. That’s worth sticking around for. I’ll keep taking my meds, just so I’m still here that day. Gives me a reason to live, in spite of my pain.